Oklahoma is home to several aircraft maintenance facilities as well as several aircraft part manufacturing and repair companies. Whether shipping a FAA repaired small aircraft engine across the state or a 747 wing overseas, packing and crating is a key component for your product's safe arrival. We have experience packing the smallest of parts to skidding and crating an entire aircraft. At Oklahoma Export Crating our goal to to help you ensure your shipment arrives at its final destination in good condition. Power and transmission equipment is often heavy and bulky. We have experience protecting sensitive equipment during transit and build crates to adequately support and protect the equipment throughout the route. The oil and gas industry are strong in Oklahoma. Equipment in this sector is bulky and delicate and requires extra care to ensure it is in good condition when it arrives. Whether it is a routine shipment of well heads, drill pipe, valves or pump sleds or a special shipment with field, mining, testing or exploration equipment we will use our packing experience to protect your investment. The energy sector often involves equipment that is large and often not a conventional shape. Our crating specialist have experience will all types of equipment and can work with you to develop a crating solution that protects your investment. If you have a crate specification, we are happy to build it to your spec. If you do not have a drawing or spec, we can design the crate to your individual packaging needs. Oklahoma's low cost of doing business and central location have brought many manufacturing facilities to our area. These facilities will often have packing needs to transport goods to their final destination. Oklahoma Export Crating can help manufacturers of any size to safely ship their products domestically and internationally. If you have extremely large, heavy or uniquely shaped equipment, we have expertise in packing heavy equipment requiring specialized, heavy duty skids or flat rack systems necessary to transport oversized or heavy cargo. We manage customer’s oversized or uniquely shaped loads that are too big or too heavy for conventional shipping containers. Oklahoma Export Crating specializes in providing mil-spec packaging to meet the stringent demands of the US Armed Services, Department of Defense and US Government agencies such as NASA and JPL. We build standard and custom designed shipping containers, crates, and pallets that meet the necessary mil-spec packaging standards including MIL-B-26195, MIL-C-104, MIL-C-52950 and MIL-P-15011. 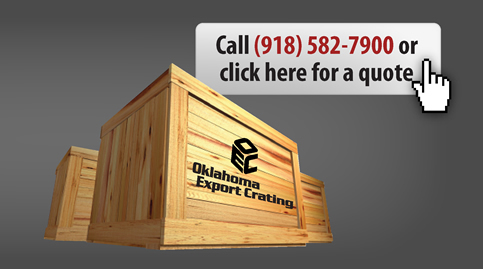 Oklahoma Export Crating also has a variety of common crate sizes available. Customers that have a continuing need for the same size crate can request for OEC to have that size crate on hand to expediate the packing process. Next day delivery is available on our export certified stock crates with 1200 lb capacity. Please contact your packing specialist to find out more about stock crates or special customer requests.